Don’t panic – we’re underfloor heating leak detection specialists! Here at Cheshire Plumbers we’re experts at leak detection and utilise the highest quality equipment to give you a quick and easy solution to your problem. One of our most popular areas of leak detection is in the growing area of underfloor heating systems. Underfloor heating can be a great addition to any home, providing economical and luxury heating to a building without the need for bulky radiators. 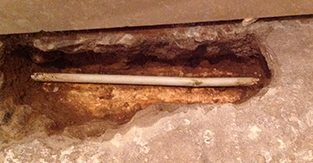 However, should a leak occur it can be difficult to find the source, and can sometimes require the ripping out of the entire floor area – which can be costly. Leaving a leak can cause damage to the area, and can stop the heating work altogether if the pressure drops. Instead of lengthy investigation, Cheshire Plumbers use a range of cutting edge equipment – including thermal imaging to quickly find the leak. Underfloor leak detection is extremely effective to find the source to a square meter, which means that the damage can be localised to a much smaller area. Cheshire plumbers can then repair the leak and get your underfloor heating up and running quickly. We have highly trained plumbers who are experts at thermal imaging and can provide you with an efficient solution to your problems. Don’t delay and risk more damage from an underfloor heating leak! Instead get in touch with a member of our underfloor heating leak detection team. We provide a range of services from plumbing, gas, bathroom, thermal imaging and leak detection throughout the country and you can be assured of a reliable and high quality service. Contact Cheshire Plumbers for more information into how we can help you.